A pleasure to be involved in the wedding party of Mr & Mrs Ashton at Lindeth Howe Country House Hotel in Bowness On Windermere. This was our first wedding party there, fab wedding venue in the Lakes! Sitting among manicured English gardens and overlooking Lake Windermere, this high-end hotel is set in a traditional 1870s mansion once owned by children’s author Beatrix Potter. 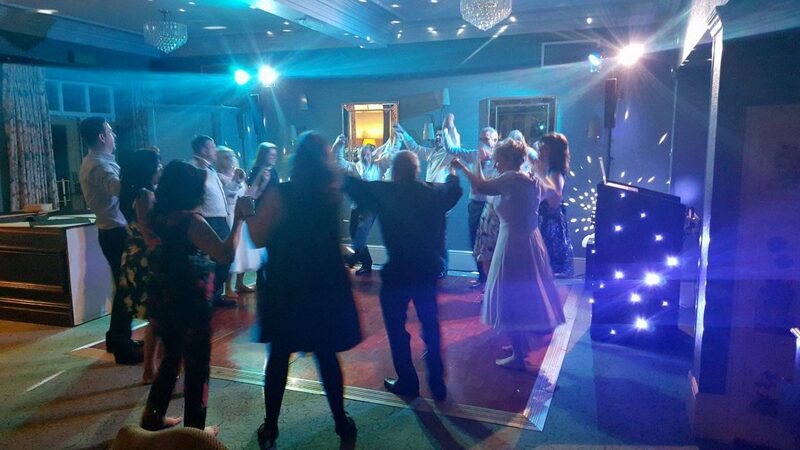 George, the groom, hired DJ Sam for their evening reception running 7pm till 12 midnight. Our DJ’s bring a modern sound & light show. They carry a comprehensive selection of music & will be able to cater for most requests on the night, which is something he’ll encourage. 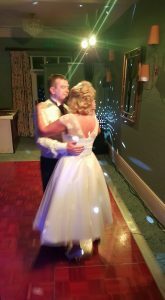 Beforehand, I’d put you in touch so that you can go through specific requests for the evening including the first dance & any other special songs (as well as any you don’t want playing!). At this point, you could, if you so wish, prepare a whole set list, which he’ll be happy to work from as required. Some wedding clients compile a list of their guests favourite dance floor songs to play from which, again isn’t a problem. You can have as much pre event communication as required to ensure we get it just right on the night. 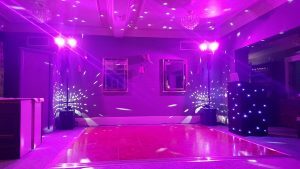 As well as the disco, he will also act as the host for the evening – introducing for example, the cake cutting & first dance, announcing the buffet etc. His dress code for a wedding is normally suit & tie as appropriate the occasion. He’s there all night & will fit in with how you want your evening to run. But if you do want any suggestions for timings etc, you can discuss it with the DJ. Our prices at Lindeth Howe Country House start from just £295 which covers playing times of 7pm till midnight (based on the DJ arriving approx. 6pm to set up). Any extra time is £30 per hour.